Shih Tzu lovers want to provide the best Shih Tzu food for their fur babies, but often fall short for any of many reasons. In this article, I am going to describe the unique needs of the breed, discuss why we may not feed the best and then look at the most common mistakes that dog owners make. Each breed has its own idiosyncrasies that set them apart form other breeds. The Shih Tzu does share many of these traits with other breeds but it is worth noting that none should be overlooked when it comes to picking an appropriate diet. These are: Brachycephalic Status, Long silky coat, High metabolic rate, and allergies, especially those that affect the skin. Let's look at each one individually. As a Shih Tzu owner, you may have experienced the noisy breathing, snorting and snoring that many Shih Tzu dogs experience, but this syndrome also may affect eating as well. If breathing is a problem then eating becomes an issue too because the dog is trying to do both at the same time. When this happens, he ingests not only his food but also extra air causing stomach upset. They needs an easy food to chew and digest. Smsp as well as softer foods that are easy to chew. The Tzu’s long luxurious coat needs to be nourished from inside as well as outside. 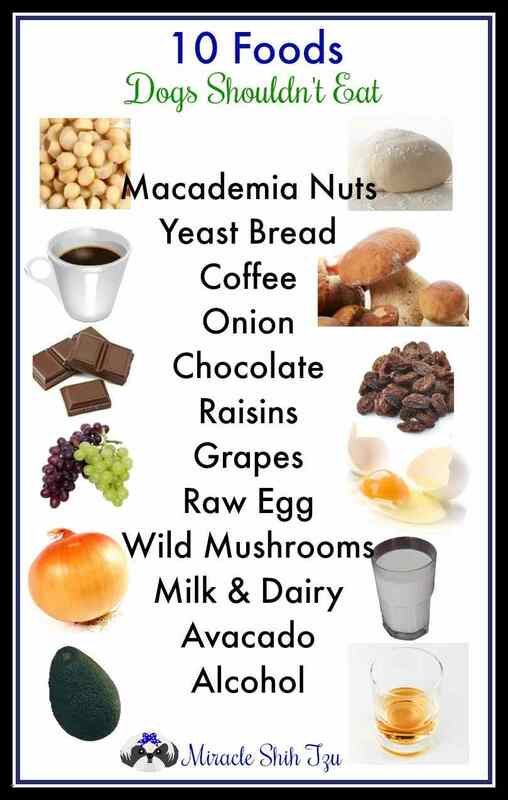 Foods that are high in fat and protein build healthy coats. Protein and fat are very important for a Shih Tzu. Protein helps build and maintain strong muscles and the fat content of the food provides energy. The right balance is important as too much fat can be just as detrimental as too little. To know whether your dog is getting the right ratio of these ingredients, check the food label. It should read 100% complete and balanced. Shih Tzu dogs are classified as a toy breed and all small dogs have a faster metabolism than larger dogs. Food choices need to accommodate this fast metabolism. For example, small dogs do not eat as much as large dogs, but they may consume more calories per pound of bodyweight. I will go into more detail below. Shih Tzu dogs are often prone to skin problems such as itchy dry skin, redness and inflammation, infections, and other conditions that cause hair loss and severe scratching. Sometimes the food is to blame for these problems. Itching is due to many causes but one cannot rule out the food that is taken in daily. Some Shih Tzu have chronic stomach problems – loose stools, vomiting, and poor appetite. While some of these problems can be attributed to other medical problems, food could be the culprit. Inferior foods will often contain artificial colors and flavors, meat byproducts, and an over reliance on plant proteins. Here is my list of the 10 most common mistake that dog owners make when choosing a food and feeding their dog. There are many reasons why people do not choose a good Shih Tzu Food for their dog. Most of these reasons fall into three broad categories: Knowledge, Cost, Attitudes. People who read widely, surf the net frequently or pose questions to their vet regularly might not understand why anyone who has a dog would make this mistake. Even though we have facts at our fingertips, the truth is that making a choice on a healthy diet is not as easy as it sounds. This is also a modern-day problem as very few people even cared about a healthy diet for their dogs even 50 years ago. But as people search for the right foods to fill their bellies, they also want what’s right for the beloved dogs. What exactly does it mean to provide a healthy diet to Shih Tzu does. Since dogs are likely to be eating the same food for breakfast and dinner, day after day, perhaps for their entire life, you need to be sure that they are getting all the necessary nutrients in addition to the vitamins and minerals their body needs. Sometimes cheap dog food does not provide that type of quality. Understanding what is in the food is very important, but so are other things found on the food label that will help you decide. High quality food does not need to break the bank, but it goes without saying that you get what you pay for. Better ingredients sourced locally, processed appropriately and distributed fresh are some of the things to look for when evaluating higher quality foods. Cheap Shih Tzu dog foods often have inferior ingredients such as artificial coloring, flavoring and preservatives. Unnamed meat or meal sources as well as unnamed meat byproducts are also common in inferior foods. By unnamed meat sources, I mean ingredients such as Poultry or Poultry byproducts. Poultry can mean anything from chicken to chicken feet. Artificial colors are less common nowadays, but cheap foods still use them along with artificial flavorings and preservatives. More about health ingredients below. If your Shih Tzu is suffering from stomach upsets, soy or wheat products may be the problem. Meats and fish that are clearly labeled such as Chicken, Turkey, Egg, Salmon and produced in North America. Proteins labeled human-grade are even better. Vegetables and Fruits should also be grown and harvested in North America. Foods containing organ meats (liver, kidney, heart) Organ meats are the most concentrated source of vitamins (especially the fat-soluble vitamins A, D, E and K. minerals phosphorus, iron, copper, magnesium, iodine, calcium, potassium, sodium, selenium, zinc and manganese and essential amino acids. Everyone has an opinion and our attitude about food is based on our opinions whether we can verbalize them aloud or they are within our unconscious minds. Some attitudes are based on facts, but many are fake news that spreads quickly around the web. Take the notion that Shih Tzu dogs can’t have corn, wheat or soy. Many of us do serve our dogs a grain-free diet, but corn, wheat or soy are not harmful to some dogs. They may be the source of allergies, but don’t rule out other ingredients that might be equally problematic. The reason many people shy away from them should do more with the quantities food manufacturers include in their blends. Conversely, the people who believe that dogs are carnivores feed only meat. A diet consisting solely of meat is just as harmful as one that relies on plants. The truth is that dogs are carnivores, but they are also omnivores like us. It is often hard to tell how much food to feed a dog. Rather than rely only on a calorie count, body condition may be a better gauge for food consumption. EMACIATED: All bony areas of the body (ribs, vertebrae, pelvic bones) are visible from a distance; No body fat, loss of muscle mass. OVERWEIGHT: Can feel ribs with a fat covering; can see waist if viewed from above but not prominent; Can see abdominal tuck. OBESE: Cannot feel ribs; Heavy fat deposits on vertebrae and base of tail, cannot see or feel waist, no abdominal tuck; may see abdominal distension. Most larger breed dogs consume about 30 calories per pound of body weight, but small breed dogs can consume much more. Shih Tzu may consume as much as 40 to 50 calories per pound of bodyweight per day. The average is 35 calories per pound of bodyweight. These numbers mean that a ten-pound shih Tzu should be eating about 400 to 500 calories each day just to maintain their weight. Shih Tzu that are not extremely active will require less calories, but if your Shih Tzu is an agility star, they are likely to need about 50 calories per pound per day. That doesn’t sound like a lot to us, but that includes all the extras such as treats and bones that you give your dog. There is a feeding chart on every dog food label, but that should only be a starting point. As a rule, an adult Shih Tzu will probably eat about one cup of food per day. Many dog food companies will sell a wide assortment of food from which to choose depending on the dog’s life stage: Puppy, Adult, Active Adult, Senior, Pregnant and lactating are just a few of the formulas that are available. Some dog foods are meant to be used throughout the lifespan and are certified appropriate for all life stages. This is a more traditional way of feeding a dog as let’s face it, when our grandparents fed table scraps to their dogs long before commercial dog food became available, they did not worry about the age of the dog. The benefits of these types of foods are that there is no need to change foods which means less gastrointestinal distress. The down side is that each life stage does have specific needs that may or may not be addressed by a one size fits all dog food. Shih Tzu dogs do benefit from a diet rich in those nutrients that nourish skin and hair. They also do best with kibble that is smaller in size. There are many different types of foods that are excellent for Shih Tzu dogs. Unless your dog is ill and needs a prescription diet from your vet, you have a wide variety of foods from which to choose. Corn is often used as the protein source in cheaper foods because it does provide a large amount of protein and is considered an energy source. Dogs are omnivores and meat is vital for their health. Ingredients sourced out of the U.S.A. or Canada may be questionable. Some foods will claim to be made in the USA but the ingredients do not originate here. Some foods are made in other countries. Regulations in some countries are not as rigid as those in North America so foods may be inferior. Dry kibble has a long shelf life; however, some companies make large runs that sit in container trucks or store shelves beyond the freshness date. Before purchasing a bag of kibble, check the freshness date. I was surprised to find out that many have already been expired. Before one can find the ideal Shih Tzu food, you must know what is in the food. Some ingredients are far superior to others, but unless you know what to look for, you may be misled by fancy dog food manufacturers that claim what they can’t deliver. For a basic understanding of reading food labels, start here. Foods preserved with vitamins E and C, often called tocopherols. Dogs thrive on a predictable schedule just like human children. They are less stressed when they know when and what is going to happen throughout the day. If kibble is available all day while you are at work, they are less likely to get stressed if you get detained at work and cannot serve their meal at the usual time. Shih Tzu are small dogs and have small stomachs. If feeding on a schedule, plan on two meals a day and more for the puppy stages. For most dogs, if you can maintain this schedule, housetraining is easier. However, the smaller size Shih Tzu need access to food throughout the day as many are grazers who love to grab a small snack in between meals. If you are worried about weight gain, place the day’s rations in a clean bowl so that it is available all-day long. You don’t need a fancy dog scale to keep track of your Shih Tzu’s weight. A simple bathroom scale will do. Weigh your Shih Tzu when you weigh yourself. The most accurate way to do this is to weigh yourself, pick up and hold your Tzu on the scale to get a weight for both of you and then subtract your weight. A typical Shih Tzu reaches his adult weight somewhere between 8 and 10 months of age. By the time he is 10 months old, you will be able to know what the correct weight for his body shape. Unless he has already put on too much weight as a puppy, this initial adult weight is a good indicator as to how much he will weigh throughout his life span. Just putting on one or more pounds for a 10-pound Shih Tzu can be like an adult adding 10 or more pounds. It is noticeable and once the weight is on, it is not so easy to remove, especially when the dog gets older and less active. Alternately, many Shih Tzu dogs are very picky and will hold out until you give them what they want to eat. Getting a picky eater on a regular diet is just as challenging as dealing with an overweight dog. Most human foods are safe for dogs but there are some exceptions such as grapes, chocolate and onions. There are others too. Check out this article on foods dogs should not eat. Human Food that Dogs shouldn't eat. Here is one area where our dogs’ eating habits differ from ours. If you do want to make a diet change, do it over the course of a week. By slowly substituting the current food for the new food, you will prevent stomach upsets that can lead to diarrhea or vomiting. 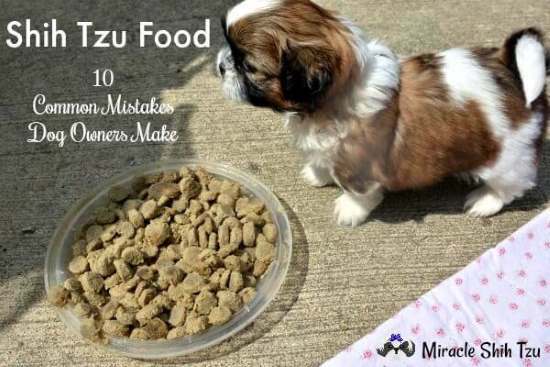 A good rule of thumb when switching your Shih Tzu food is to use this formula to change foods. You can adjust this if your Shih Tzu has an exceptionally sensitive stomach. Many people stick with the food recommended by the breeder and that is fine. However, your lifestyle or finances may not permit a continuation. For example, if you have feed kibble to your dogs in the past and the breeder expects you to prepare a raw diet, this may be difficult. Some people hate the smell of canned dog food. Some people think that kibble is not healthy. Homecooked meals may be perfect for some but pose a hardship to others. As we mentioned at the beginning of this article, each person has his own bias when it comes to food. More importantly, your lifestyle should dictate to some degree how you feed. Do you travel frequently? Do you have a busy life style? Are there other pets in the home? Find a diet that works for you. If it is healthy and meets the requirements that I have mentioned above, you will be fine. It might seem like rocket science, but once you know what to look for, you’ll be able to pick a healthy food for your Shih Tzu. You may also want to check out these other articles about food and nutrition.